Wedding rings today are a sentiment of love, but no one can really say for sure when this age old tradition actually started. Some believe that the oldest recorded exchange of wedding rings comes from ancient Egypt, about 4800 years ago when sedges, rushes and reeds, growing alongside the well-known papyrus were twisted and braided into rings. But the circle was the symbol of eternity, with no beginning or end, not only to the Egyptians, but many other ancient cultures. The hole in the center of the ring also had significance. It wasn’t just considered a space, but rather a gateway, or door; leading to things and events both known and unknown. 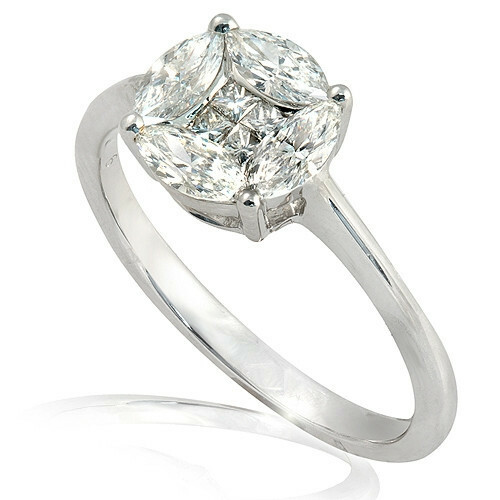 To give a woman a ring signifies never-ending and immortal love. Let your engagement ring from Bel Air Jewelry be a powerful symbol of all the joy and happiness to come. When you look into the infinity of your fiancé’s eyes, pick a ring that says forever with same furfur as the passion in your lover’s heart. Eternity is endless time. In philosophy and mathematics, an infinite duration is also called everlasting. Aristotle would say that the natural cosmos, the past and future, have an eternal duration and like the eternal Platonic Forms; it is timeless. Eternity is often symbolized by the image of a snake swallowing its own tail, known as the Ouroboros. The circle is also commonly used as a symbol for eternity, as is the mathematical symbol of infinity. Despite math, the cosmos and a giant snake, all explanation and reason is lost in the looping arms of your lover. When you say forever, there’s no better symbol than a ring that shows your deepest passions and defiance against the stars. This season don’t hold back; be brave enough to say forever with Bel Air Jewelry. The basic human need to own and wear materials we deem “sacred” or special is what drives us to collect rocks and minerals. Perhaps this explains the lure of birthstones; how powerful it is to have our month of birth represented by a beautiful natural gemstone. Sapphires are the precious stone for those born in the month of September. They were believed to have special protective powers, such as preventing envy and protecting the wearer from poisoning. Some ancient cultures even thought that if a sapphire container held a venomous snake, it would die! In addition, people believed that sapphire ground to a powder had medical healing properties, such as the ability to cure colic, rheumatism, blindness, and mental ailments. Sapphire is a form of the mineral corundum, and it exists in a range of colors from light to dark blue. Corundum is the second-hardest mineral after diamond. Sapphire is any form of corundum that is not red, as red varieties are called rubies. These dark sliced sapphires have a sort of raw, natural, undefined beauty. Wear this month’s birthstone by Bel Air Jewelry and enjoy not only the compliments, but the good luck that will follow! In celebration of the growing adoration of emerald and green in today’s fashion world one striking image comes to mind; Cleopatra. In ancient Egypt, color was an integral part of the substance and being of everything in life. Green (wadj) was the color of vegetation and renewal. To do “green things” was slang for beneficial, life-producing behavior. Osiris was often portrayed with green skin and referred to as “the Great Green”. In Chapter 77 of the Book of the Dead, it is said that the deceased will become a falcon “whose wings are of green stone”. The Eye of Horus amulet was commonly made of green stone as well. The pigment was derived from malachite and was often worn around the eyes to symbolize power and life. Who can forget the way it empowered the brazen face of Elizabeth Taylor, with blues and greens so remarkably intense, that for a moment she was like the Egyptian ruler herself. Let your own inner ruler shine by enhancing your natural grace with these powerful emeralds by Bel Air Jewelry. What is a star? Science refers to the incandescent ball of light as a fixed luminous point in the night sky that shines at a distance from our world like the sun. For at least a portion of its life, a star shines due to thermonuclear fusion of hydrogen into helium in its core. It releases energy that traverses the star’s interior and then radiates deep into outer space. For some stars, the end of their life is marked by a beautiful supernova that explodes out into the galaxy. Truly, the journey of a star is something special… and so are you. Scientifically speaking, you’re made of specks of ancient star dust. Remember your own majesty and let the heat of your passions burst like a powerful supernova! Let your inner light shine like the unstoppable power of the sun. Are you drawn to the gravitation of your sweetheart like two powerful star-crossed lovers forming a brilliant star cluster of galaxy? Whatever fuels your core, let this sapphire diamond ring from Bel Air Jewelry inspire luminescence wherever your journey leads. Celebrities like Carrie Underwood have started toting yellow diamond engagement rings instead of a traditional wedding band. This may be new to fashion but the color yellow is steep in ancient tradition and symbolism. Yellow, in the form of yellow ochre pigment made from clay, was one of the first colors used in prehistoric cave art. The cave of Lascaux has an image of a horse colored with yellow estimated to be 17,300 years old. In Ancient Egypt, yellow was associated with gold, which was considered to be imperishable, eternal and indestructible. The ancient Romans used yellow in their paintings. It’s even found frequently in the murals of Pompeii. However to the Western Culture yellow is the symbol of summer, vitality, friendship and now because of it’s recent explosion in fashion; romance. If you’re looking for a gift to give yourself or another, adorn yourself with yellow diamonds and white gold with this ageless classic by Bel Air Jewelry. Like a warm summer breeze drifting over the surface of the ocean, this sapphire gradates in waves of deep blue to glacier white diamonds. The flower is open and full like the tides; moved by the command of the moon. But nothing is more powerful and moving than your deepest desires fueled by love. Let this ring by Bel Air Jewelry conquer the moon and take you across the waters, to the place your passion waits to bloom. Diamonds are forever. At least, they’re supposed to be. Remember how you felt seeing your partner kneel down as they opened a small box and asked you to share your world with them? Your love is still fresh and new but the glisten in your wedding band has gone. Don’t let the elements wreak havoc on the bright beaming symbol of your love. Follow these quick steps to ensure your wedding band from Bel Air Jewelry is as clear and brilliant as the passions you still have burning for partner.